Last month, CBS pulled Three Rivers from the Sunday night schedule. Though the network would only say that the show was going on hiatus, most suspected that it had indeed been cancelled. We now know for sure. Three Rivers follows a group of medical personnel in Pittsburgh who work in the fast-paced and emotionally-charged world of organ transplants. The series stars Alex O’Loughlin, Katherine Moennig, Daniel Henney, Justina Machado, Christopher Hanke, Amber Clayton, and Alfre Woodard. The series got off to a slow start in the ratings and viewership got worse as the weeks wore on. The writing was on the wall when CBS decided against ordering any additional episodes beyond the initial 13. In early December, Three Rivers was pulled from the schedule but the network has declined to call it a cancellation — until now. Will CBS air the rest of Three Rivers? Unfortunately, there’s no word yet as to when or if the five unaired episodes of Three Rivers will be shown. What do you think? Will CBS run the unaired episodes or will we have to wait until the series is (hopefully someday) released on DVD? 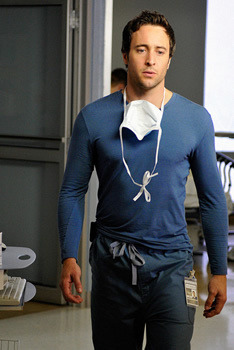 Three Rivers: CBS Pulls Alex O’Loughlin Medical Drama; Cancelled? Cold Case: Sunday Experiment Significantly Boosts Ratings, Is It Enough? Three Rivers and Cold Case: Up in the Ratings; Enough to Save Them? Three Rivers: Poor Premiere Ratings; Cancel It or Keep It? Please bring back Three Rivers! We need you to bring back the good shows. This is why our world is going down because all the good TV shows are being taken off. Just found this show on Netflix watch all the episodes in one weekend, I was hooked, all dr.s are GREAT and I love Mirandas “take no prisoners” personality. …and would you know it was cancelled, got to love the minimum people who make that call. I am just now watching Three Rivers and love it. I wish it would have lasted a lot longer. I also just watched Moonlight and loved it. I am now watching Hawaii Five 0 and love it also. I did not know who Alex O’Loughlin was until I started Hawaii Five O but will watch anything with him in it in the future. “Three Rivers” was great and I’m saddened to see it removed from life support.